Bring human rights to your celebrations of Chanukah and Passover, to your synagogue kiddush, and more. Through partnerships with Divine Chocolate and Equal Exchange, we are proud to offer kosher fair trade Chanukah gelt, kosher-for-Passover chocolate, coffee, and more that come from companies committed to dignified working conditions and environmental sustainability. Proceeds from these purchases support T’ruah’s work ending modern-day slavery. Note: We are grateful to Fair Trade Judaica, for launching this project and partnering with us on it for many years. While Fair Trade Judaica recently closed, we are honored to continue its legacy by making these delicious products available. Buy fair trade, kosher-for-Passover chocolate. 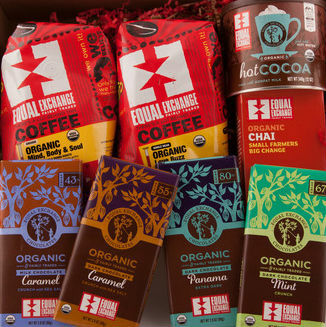 Buy fair trade coffee for your synagogue, school, JCC, home, or other institution. To order Guilt-Free Gelt in bulk from Divine Chocolate, create an account here and use code “guiltfreegelt” at checkout. For individual orders of Guilt-Free Gelt from Divine Chocolate, click here. What makes this gelt guilt-free? When we eat gelt, we don’t want our enjoyment marred by concerns of human rights abuses. But child labor, including modern-day slavery, has been documented in cocoa fields in many of the world’s leading cocoa producers. Chocolate that has received fair-trade certification is free of forced labor and ensures that farmers were paid a sustainable price for their cocoa crop. Get Updates & Action Opportunities!